The Cobra King F8 combo iron set features the King F8 hybrid which is smarter, faster, and has Baffler Technology to deliver maximum playability from all lies. 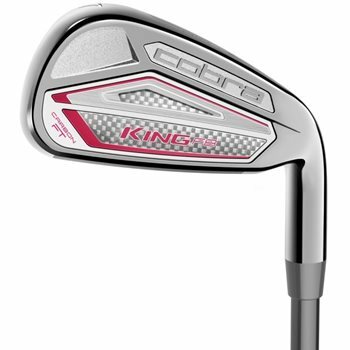 The Cobra King F8 irons are Cobra’s first ever connected irons with Cobra Connect Powered by Arccos. The King F8 irons use Forged VFT PWRSHELL Face Technology that enhances the Sweet Zone for faster ball speeds and higher launch across all points on the face while the lower profile clubhead design lowers CG for higher launch and more clubhead speed. For the first time ever in an iron, a lightweight carbon fiber medallion supports a thinner face while delivering improved sound and feel. Tailored performance throughout the set is delivered by TECFLO Progressive Set technology and Progressive Spin Technology uses V-Grooves on the 4-6 iron to reduce spin, U-Grooves on the 7-PW optimize spin and wedge-spaced grooves on the GW-SW deliver extra spin for shots around the green.